volunteers at their annual Fall Food Roundup on the evening of October 7th. 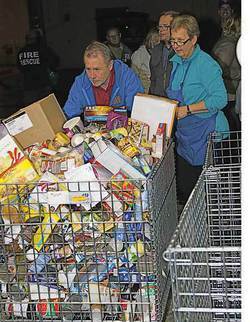 The annual Fall Food Roundup at the Leduc & District Food Bank saw a record amount of volunteers and food donations roll through the door, most in the course of just one evening. On October 7th, between the hours of 5:30 pm to 9:00 pm, between 350-400 people went door to door in Leduc to gather food and essential items to assist struggling families. Everyone from individuals, to family groups, to representatives from the local Girl Guides, Brownies, Remax Realty, Boys and Girls Club, various churches, volunteers from the City of Leduc, and many, many more went door to door canvassing for non-perishable food items. As is so typical of this great community, Leduc broke all previous donation records with 19,308 lbs of food collected in that 3.5 hour stretch, and another 10,000 lbs on top of that which arrived over the next few days that had been raised in conjunction with the event. With the Food Bank typically handing out between 20,000-25,000 lbs of food every month, "This is a very important food drive for us. We pretty much use up the stock we have in the warehouse by now so this helps restock our shelves." said Executive Director for the LDFB, Gert Reynar. Gert also stated that she felt the LDFB was currently "ahead of the game" this year and with the stock they have on hand it should see them through the end of December. That is where it once again tends to become a little touch and go with supplies. Due to various reasons, donations usually drop off at the end of December and unfortunately this is when client demand can be very high at the LDFB. Statistics from the LDFB's annual report help to show how much of a difference this important organization makes in our community. In 2012, 264,019 lbs of food was distributed helping to feed 937 adults and 722 children in Leduc and County. Thankfully the numbers showing first time clients to the Food Bank has been slowly decreasing in the last few years, dropping from 229 in 2010, to 221 in 2011, and finally 205 in 2012, but this does not mean that the demand has lessened. Just the opposite actually since it shows that since 2010 another 644 people required the services of the LDFB, and this is not yet taking into account the numbers for this year. This is why dedicated volunteers and year round fundraising efforts are so important to the food bank. Because even though donation amounts fluctuate at certain points throughout the year, the demand is ongoing and unfortunately, continually increasing. People and organizations that are passionate about supporting the LDFB realize that this is the case and regardless of whether there is a special event occurring or not, they continue to raise food and funds for the Food Bank. Locally owned stores such as Sobeys, Safeway, and No Frills always have donation bins available and many businesses around town encourage staff and clients alike to bring in donation items all year long, and a few even occasionally offer discounts in exchange for donated food items. One business that has recently been collecting a large amount of food for the LDFB is Farm Credit Canada. Every year they run their "Drive Away Hunger" program where they collect non-perishable food items all year long at their location, and in mid-September they partner up with four different schools in Leduc as well as The Boys and Girls Club. Then, as the program comes to a close on October 16th, city residents will see a farm tractor and trailer chugging around Leduc loading up all the food items everyone has collected at those locations and delivering everything to the LDFB in true country style. The Leduc and District Food Bank is heading into it's 30th year of service to this region with no signs of slowing down any time soon. And it is during this time of year when everyone counts their Blessings, that there are literally thousands of people in Leduc and area who are taking a moment to give thanks for all the staff, volunteers, and donors who continue to keep the shelves stocked.